Today we'll be talking about AB eye tapes! So those of you with uneven eyelids or monolids can rejoice, hooray! :) We know what it's like to suffer from eyes that look like this o_O all the time - believe us, we've been there and done that. It gets especially frustrating when it comes to makeup application and our eyeliners are thick on one side and thinned out completely on the other. We hear you girls, so we hope this post will be enlightening to those suffering such issues! 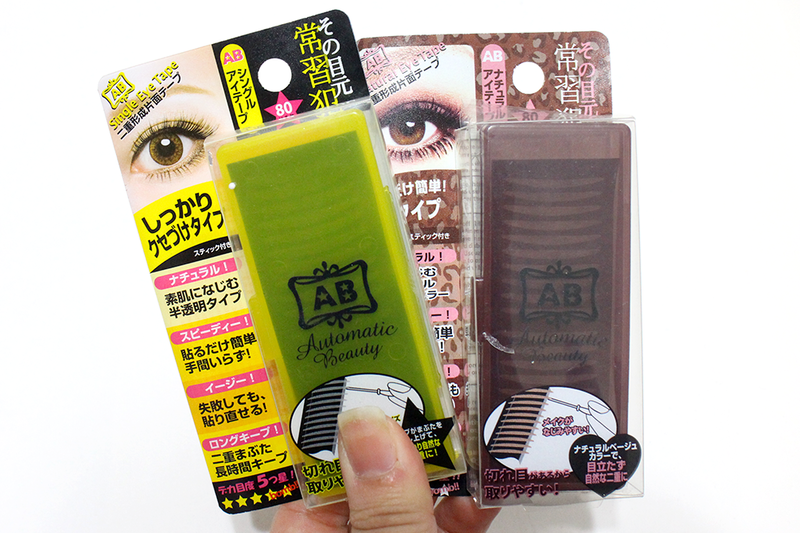 There is actually a huge range of AB eye tapes (glue included), but we were sent the two shown above, which is the Single Eye Tape and the Natural Eye Tape. I do not have single eyelids, but I do experience uneven eye lids, especially on days where I do not get enough sleep (ANYONE ELSE SUFFERING THIS!?). It makes me completely dread waking up the next morning where I know I'll wake up and look really weird somehow, plus applying makeup would just be a total hassle. These two tapes come in handy in their own way for my eyelids, but in case you're wondering what tape might suit you best, you can always refer to this chart. 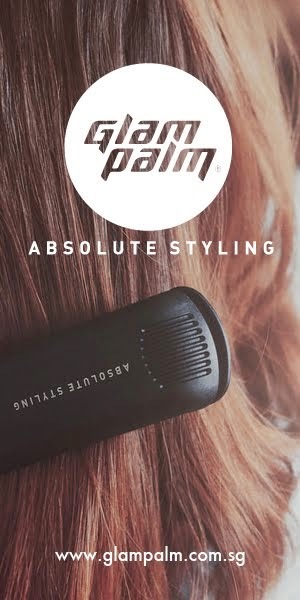 Their website also has videos to teach you the different application methods. The back of the boxes also have some instructions and, even if you cannot read Japanese, they are pretty straightforward. This is what you should typically receive. 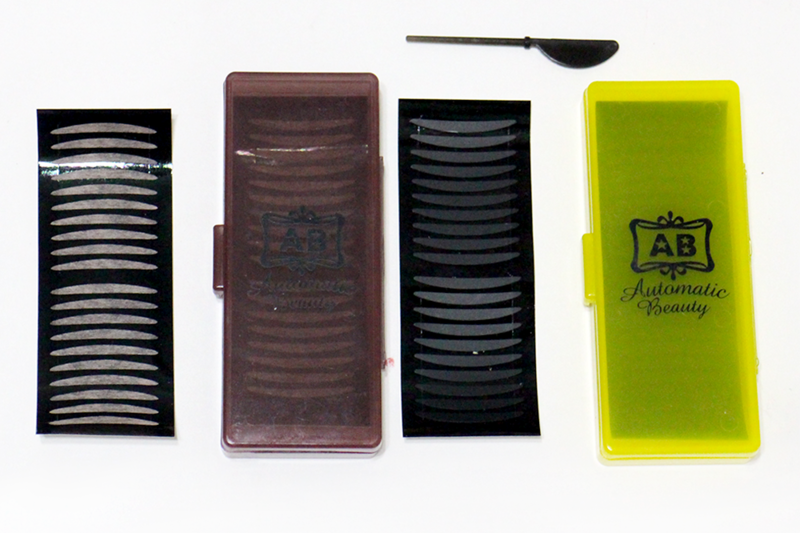 With each box, you get a "sheet" of eyelid tapes. They're all the same shape, which is actually pretty great because we've gotten some sheets with "left eyelid" and "right eyelid" tapes.. which eventually become unevenly used because of 1) messed up attempts 2) a well-behaved eyelid on one eye which does not require tape on a certain day. These consistent shapes make it easier for you to adjust on your eyelids and also to take them out without worrying which "side" you can use that day, or which "side" has run out. This is what they each look like closer up. 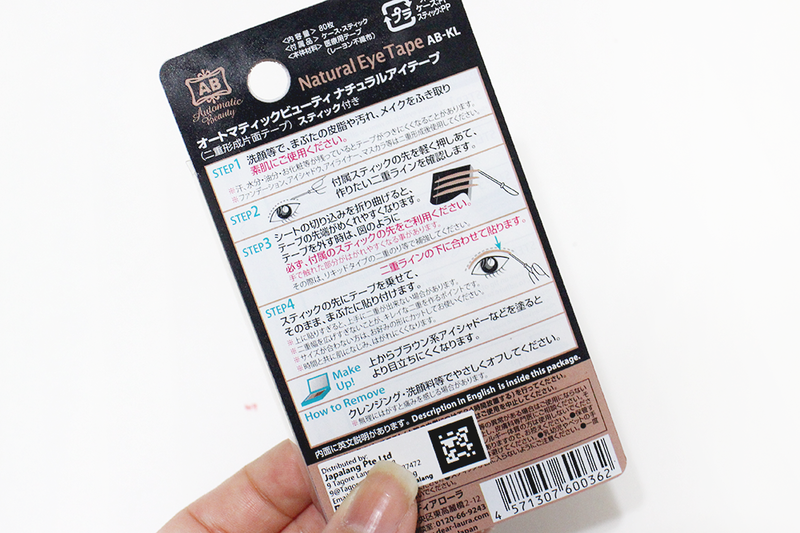 As you can see, the Single Eye Tape has a more plastic-like texture and the Natural Eye Tape is made of a softer fabric-like material and has a matte-finish which is actually great to apply makeup on. As you can see from the picture above, the tapes are actually very thin which gives it extra plus points because it lowers visibility after usage onto the eyelid. 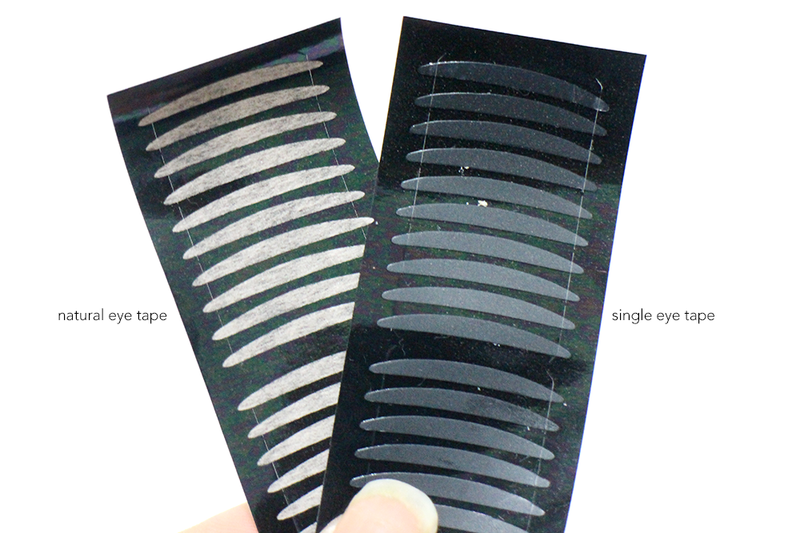 The width of the Natural Eye Tape (as shown above), measuring at 2.2mm, is slightly lower than the Single Eye Tape which measures at 2.5mm. 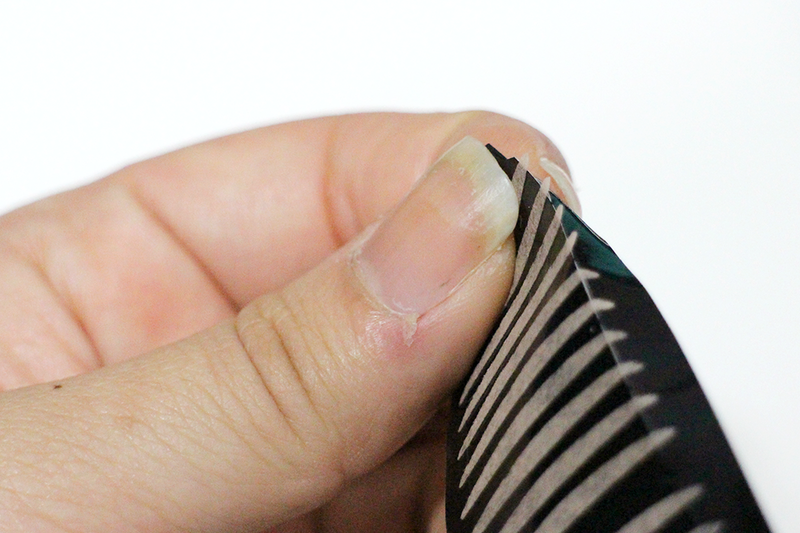 Though difference wise, 0.3mm is hardly anything to notice, it means that the Single Eye Tape would be able to push up eyelids better and create a thicker lid. 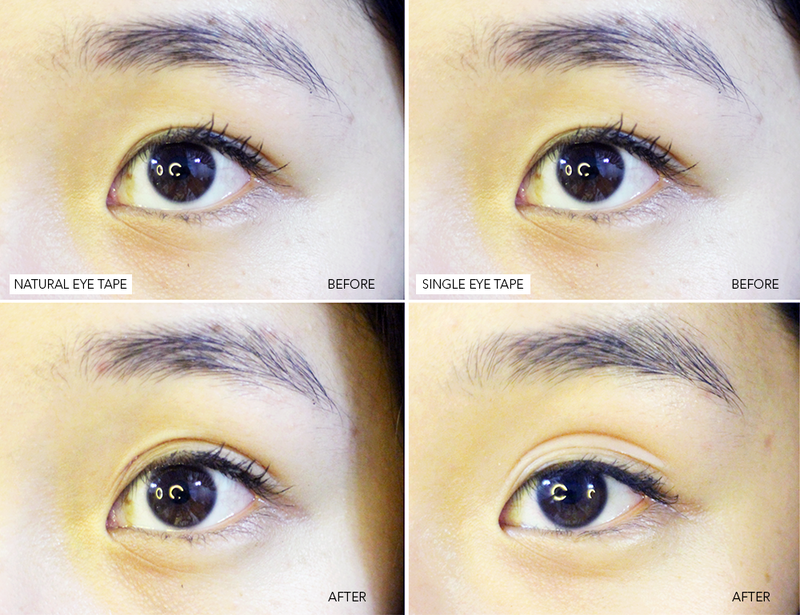 As mentioned above, since the Natural Eye Tape is more fabric-like, it is also much softer. It is highly recommended that if you want a higher lid, you opt for the Single Eye Tape. 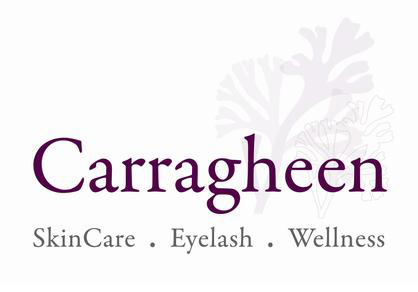 If you want something more natural that you can apply eye makeup over, opt for the Natural Eye Tape instead. sorry for the slightly weird lighting! The Natural Eye Tapes do heighten slightly but the finish is indeed natural and looks really pretty! For the Single Eye Tape, you get to have that "Ariana Grande" high eyelid shape and is really hard to notice the tape there unless you zoom in to have a closer look. Of course, this is just an option for you to see how well it holds higher up, but you can always feel free to lower it to a height you are comfortable with. Both can be covered with the help of makeup, though I would suggest that - if you are going to use eyeshadow - you go with the Natural Eye Tapes instead. If you want to put eyeshadow/eyeliner and use the Single Eye Tape, put it on TOP of the makeup. Hope you enjoyed this post babes! A big shout out and thank you to Beauty Carousel for giving us these tapes to try out! i preferred it when you girls were reviewing makeup more than the sponsored services that are plastered all over your front page these days! found a real gem in your nonstop swooning of guerlain meteorites, and would love to discover more makeup treasures through you two!